If allowed only one word to describe our approach to strategic planning, it would be inclusion. We recommend that our clients include every stakeholder group, both internal and external, in the process of strategic planning. Occasionally, where physically and economically possible, we recommend that literally everyone be included. Surveys, focus groups, interviews and large information exchange meetings are tools that can be used to gather data and learn about different perspectives. But these tools used alone can result in an implementation process that incurs undue cost, the loss of key people, and periods of chaos and instability. 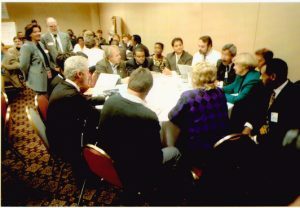 Support from everyone is required to proceed smoothly to implementation, and that support is best elicited when all members of the whole system see all the perspectives, struggle themselves to understand the implications of what has happened, formulate a vision for the future together, and participate in the planning of appropriate action. When the planning process is well designed, everyone’s perspective shifts from a local view to a more encompassing view. People change their minds about things without having to be persuaded or coerced. When the plan is created with active engagement (the second word we would choose to describe our work), no selling of the plan is necessary. “Buy-in” is automatic. Strategic planning very nearly died in the early nineties. As practiced then, it was more often than not ineffective, producing little more than a document that was celebrated briefly, then forgotten. Analyses by small executive teams of strengths, weaknesses, opportunities, and threats (SWOT) without inclusion, active engagement, a focus on the future, a context shared by everyone – and a shared understanding of the external world – produced documents but not action. We are social psychologists. Our expertise is in the design of a series of active engagements that create a planning community capable of making strategic decisions and implementing them. Your role is to reach out to everyone in your organization, and to reach out to your community and your network, to ask for their active participation in strategic planning events. It is through their active engagement with other stakeholders that you will get their best input, counsel and advice. The role of the resulting planning community is to gather all relevant data about the environment in which your future lies, and to characterize what the future of the environment is likely to become. The role of the planning community is to reflect on your history with a view to understanding the momentum you carry; to create a vision of what you want to become; to formulate plans on how you can reach your vision; to make strategic decisions. The role of subsequent implementation teams is to make change. Our role is to be your guide through the process of strategic planning and the resulting strategic change. We will stay with you as long as you find our assistance helpful, which could be the point where your vision is clear and lucid, or the point where your goals and sub-goals have been determined, or the point where your board approves your new strategy, or the point when all changes have been implemented (and you are ready to start again). We have worked with many clients in diverse fields and industries, and we will not hesitate to suggest something that worked at 3M or Fannie Mae, or Organon, or a branch of the UN, or something that worked in Shri Lanka or Malawi, or Nepal or China. The real experts on your business are you, your people, your customers, your vendors, your competitors, your shareholders, and maybe a guru in your industry. In today’s turbulent world, each of your experts knows something about your present situation and what is about to happen as the future unfolds that the others don’t know. The biggest reason strategies falter today is failure to include those who have the latest and most reliable information in the process of strategy creation. We know how to guide the real experts (you, and all the others) in a planning process that provides a clear vision for the future, multiple strategies for reaching that future, and concrete steps that can be taken tomorrow. Along the way we help you establish a sense of urgency and create a strong guiding coalition. Most importantly, our process creates alignment and commitment to the strategy and action plans as they evolve. If you are like our other clients, you will be surprised at the time savings that derive from wider participation, and find that you need to do a lot less to move from strategy to implementation. For a partial list of client organizations and communities see Clients. Where do we start? It would be nice to have a client who wants to start strategic planning at the very beginning, but our experience is that most of our clients are somewhere in the middle. Wherever you are, that’s where we start. For every issue there is a community of individuals, groups, and organizations who care about that issue. For example, the issue of Children at Risk in the United States leads us to a community that includes parents, social service agencies, educators, government, the children themselves, and others. A lot of our strategic planning work over the past fifteen years has been with communities defined by an issue. In April of 1997 the community defined by Children at Risk in the United State s was assembled in Philadelphia as part of the Presidents’ Summit. In this photo, President Clinton meets with the Kansas City Delegation. Gil Steil and Tammy Blossom observe their meeting design in action. The underlying principles of good strategic planning apply equally well to communities defined by an issue, even though methods and time-frames are different. What’s changing both outside and inside our community? How are we responding to those changes? How will we get there? What shall we do differently? We provide a number of ways for communities to grapple with these important strategic questions. Your issue may have a community that needs to assemble and engage. We can show you how. Geographic communities do well to plan as a whole.We have helped Salida, California and Melrose, Massachusetts revitalize themselves, and we would be happy to discuss how your community might benefit from strategic planning. For many communities the education of their youth – and now their adults – is their biggest concern. We have worked with public education at all levels, including the National School-To-Work Program; the State of Maine; Monroe County, New York; the cities of Burlington, Vermont and Carson City, Nevada; the Snohomish, Washington School District; and the towns of Ryegate, Groton, and Wells River, Vermont. We have also worked with colleges, universities, and professional schools, including Worcester Polytechnic University, Boston University’s Goldman School of Dental Medicine, and the University of Rhode Island. We like the challenge of difficult assignments. For WPI we designed and led a four day large group meeting that recreated the Freshman Year Program – with the whole system in the room (administration, faculty, parents, students, staff, graduates, applicants, …). Health and health care systems are an ideal domain for the application of whole -strategic planning. It seems to us that progress in providing universal health care could be greatly accelerated by getting whole systems to focus on implementation. We’re ready to help. Our health care system clients have included a large urban hospital system (we led the redesign of the organization from top to bottom), a chain of suburban hospitals recently merged (we did a cultural assessment), and a major Dental School (we did strategic planning and preparation for accreditation). In the arena of specific health issues we have been very active over the past fifteen years, especially in our work for UNICEF, the UN Development Program (UNDP), and the UN Family Planning Agency (UNFPA). Q: Our leadership team already knows what it wants to do. We’ve spent a lot of time working on our strategy and we are not really interested in reopening issues that are already resolved. Can our implementation process be smoothed using your methods? A: Yes. We start with your strategy as developed by your team. We involve the whole system in understanding the plan in depth as it embarks on planning the required changes. It’s not unusual for the whole system to identify improvements to the strategy as it thinks through implementation. Q: It sounds really expensive and time consuming to hold one or more relatively large meetings that involve all stakeholders. Is it? A: No. Compared to the usual processes of gathering data, making decisions, and then obtaining “buy-in”, it is remarkably efficient. Imagine getting this done in a week, or three days. One of our professional school clients shortened their accreditation process by 50%. Six countries in South Asia agreed to a strategy to conquer a disease in two and a half days. Q: You have no idea how much conflict and polarization there is in our company. I can’t imagine anything happening in a meeting of the whole system other than a series of explosions. I don’t know why I’m still reading this page of your website. A: You are still here because you really need people to collaborate. You need them to stop the shooting and to work on behalf of what’s best for the company. You need individuals to give up self-interest when pursuing self-interest is in conflict to your mission and goals. A: This is where we shine as a consulting firm. We understand that we humans have an automatic collaboration response when the conditions exist that elicit it. We’ve spent twenty five years discovering those conditions and how to create them. Since 1993 we’ve never witnessed an explosion or a shootout at any whole system event. In organizations or communities wallowing in divisiveness we witness the opposite—pure excitement and enthusiasm when the whole system discovers common ground. A: And this year we decided to share what we’ve learned about eliciting collaboration with everyone, in the form of a book, The Collaboration Response. Reading a few chapters can help you decide if we are the right consulting firm for you.